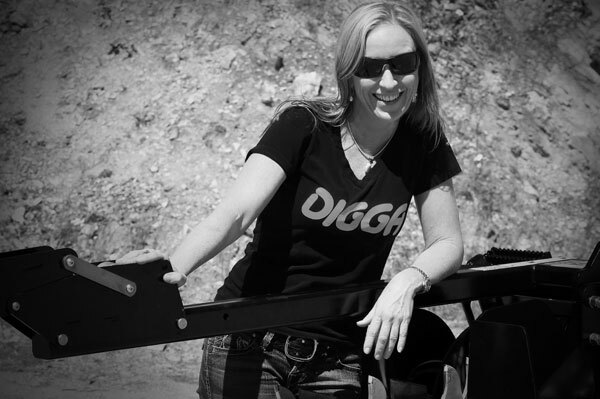 Pictured: Digga CEO Suzie Wright with a Digga Bigfoot Trencher. Digga Australia is a success, no matter what measure is used. The privately Australian-owned manufacturer and supplier of high-quality machinery attachments stands tall. The company employs over 200 people across three countries. The main factory, a 12,500m2 manufacturing facility in Brisbane, houses a wealth of precision high-tech robotics, machining centres and fabrication equipment. Additional manufacturing facilities in Australia are located in Sydney and Melbourne. Primarily exporting to North America and Europe, Digga has additional manufacturing branches in the UK and opened its latest facility in 2013 in Dyersville, Iowa, USA. Digga supports an extensive professional dealer network across the globe. Aside from the manufacturing, there’s a healthy research and development department dedicated to ongoing improvement of current product lines and development of new and innovative products. There’s a lot more this company can deservedly boast about, but it’s clear it’s a juggernaut. Steering that juggernaut, steadily and with increasing momentum, is the irrepressibly cheerful Chief Executive Officer, Suzie Wright. GROW AND GO - “I was christened ‘Suzie’,” laughed Wright. She laughs a lot. “My dad named me after his Suzuki motorcycle.” Born and bred on the Gold Coast, Suzie’s father started in the earthmoving industry, moving onto bridge building and piling work. Suzie, a qualified rigger, worked on her father’s barges as a youngster, and, not wanting to attend university, moved to Sydney where she worked in the Entertainment industry building stages and lighting rigs for international entertainment acts and conventions after finishing high school. An injury put a stop to climbing and heavy lifting and prompted a move to restaurant management, which went well enough for several years. But, while still in her mid-20s, Suzie moved back to Queensland and again joined her father’s business, building the extension of the boardwalk around the Brisbane River. It was at about this time, the mid-1990s, Suzie met future husband Stewart Wright of Digga Australia. Digga supplied augers to her father’s burgeoning business. After over a decade in the role, Wright has overseen Digga Australia during a time of unarguable success across several fields. What does she see as a personal highlight? “We’re a proud Australian manufacturer and one of the largest projects we undertook was building the Octal Street factory in Yatala. We were in a company-owned factory in Staplyton with five factories and a main road running through the middle of us, and we just couldn’t get any more productivity out of that setup. It was at its limits and we needed room for growth." "We’d done a lot of work with Federal and State governments promoting manufacturing and assisting with promoting this region, and they helped us find the land we eventually purchased. We bought just before the property boom, which was ideal, and we were able to merge five separate factories into one. The original stage was 8000 square metres. Within 12 months we had to expand and added another 4500 square metres. It’s all under one roof and state of the art." That was the start of a process that Wright cites as Digga’s biggest single achievement so far: a 500,000 newton-metre drive. Utilising the five-post design, but obviously a lot larger, these drives are mainly used for installing large screw anchors. The power generated by the gearbox is amazing enough, but the power generated from such a compact assembly has Suzie fair glowing. A LONG WAY TO GO - Stewart and Suzie are no longer married, but are still great mates and still enjoy working together. Digga is still growing and going strong, and Suzie has no real thoughts of retirement or ‘moving on’. “I don’t think I ever see myself retiring,” said the always-cheerful CEO. “I love the good and the bad, I love the crazy lifestyle, the industry, and the challenges it brings. I cherish the people I work with and learn something new every day. I don’t do bored very well, so I think I’ll stick to being the leaders in boring – pun intended!” she laughs.